Jan. 3, 2013 1:00 p.m. Most families are back into their routines following the 2012 Christmas holiday season. There are many others that will continue to reflect back on the experiences of December 18th. 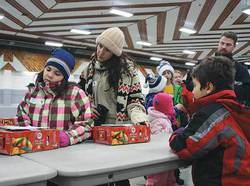 This was the evening that, as Sharla Campbell, FCSS describes, “53 drivers registered to deliver hampers … as you saw, most of those registered had anywhere from 1 – 3 people with them helping out — so a safe estimate is probably around 150 people turned out to deliver”. It was an awesome year with toy donations covering all of the need for everyone that applied and cash donations have covered the costs for the Christmas Dinner certificates. As always, Wetaskiwin came through in a big way. Armed with GPS’s, maps and a geographical knowledge of the City, the volunteers ventured out into a winter evening carrying armfuls of gifts to share with others so they too, could enjoy a more enjoyable Christmas. All I Want for Christmas is an A.S.P.